Marilyn Borglum has been drawn to horses since childhood. 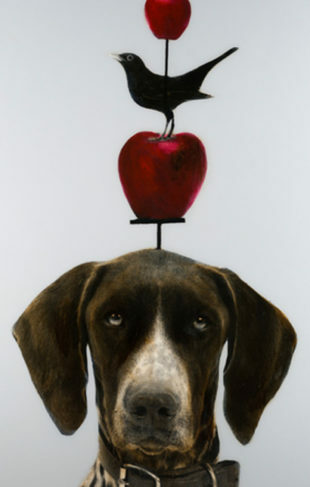 She pursued a degree in Animal Science before switching to a major in the Arts. 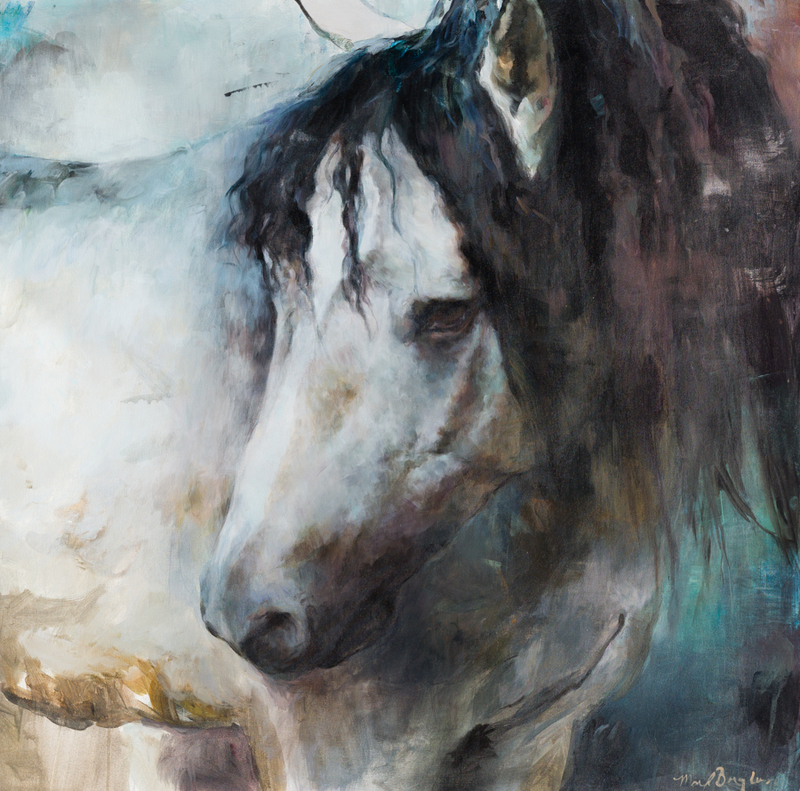 In her equine portraits, she explores movement and form, along with her strong symbolic connection to the animal. 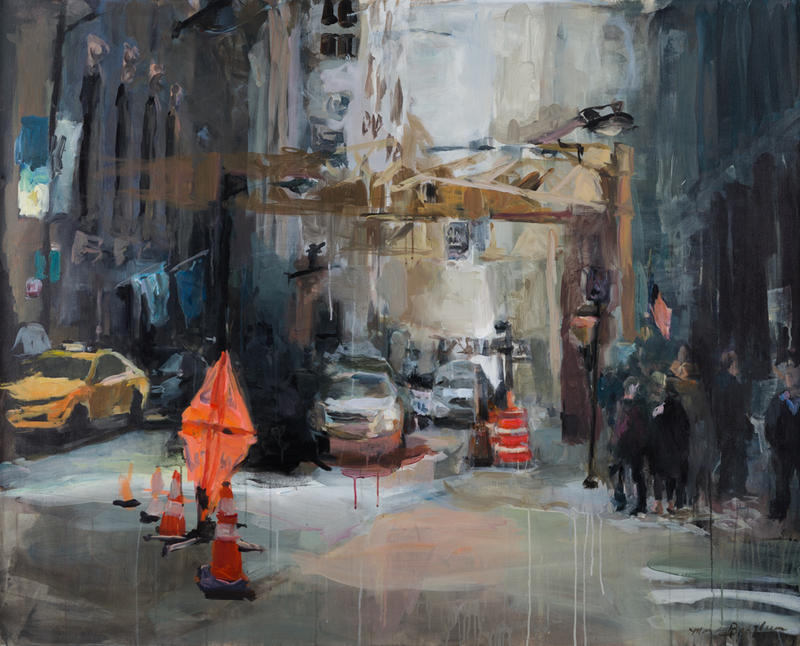 Borglum’s portfolio has evolved over time to include expressive cityscapes and human portraits. 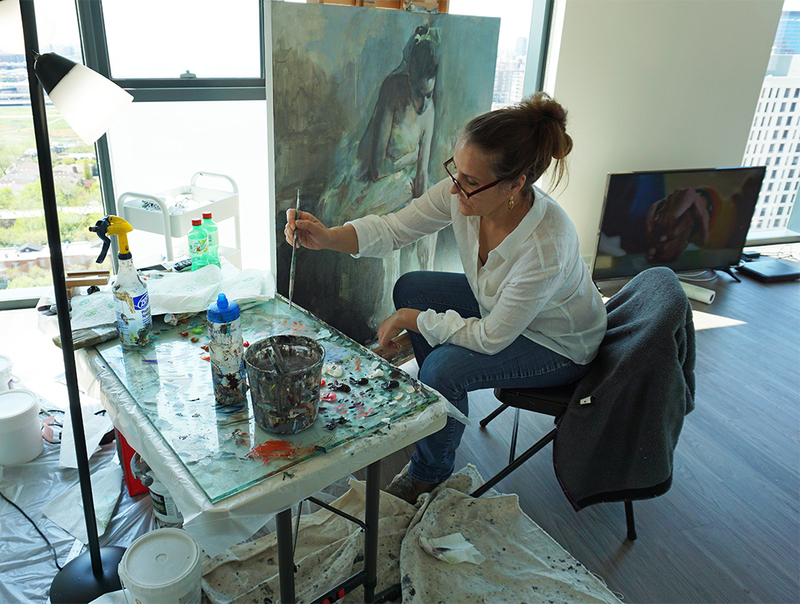 Working with different mediums, from acrylic paint to black crayon, Borglum renders each of her subjects with dramatic value contrasts and gestural lines. Read more about Marilyn Borglum’s background and process in a conversation with our gallery. MB: It starts with conceptualizing how I imagine a painting to look, and then it’s driven by how I feel about a subject. Sometimes it will be in my mind for months before I decide to start it. For the horses, I hire a photographer. We pick out a particular horse depending on what I have in mind, I choose the drapes and the lighting, and at the end I have a photograph created out of my direction to her. Then I’ll do the painting pretty much exactly like the photograph. With the city scenes, I used to go out right on the sidewalk and just sketch from life, which became problematic because of weather and onlookers. So I started doing those from photographs, too. And those are more about trying to get the essence of the city, the constant change of people passing through, and the feeling that you get when you’re around all those people but you don’t necessarily have any connection to any one of them. Borglum extends her expressive style to different subject matter, from cityscapes to figures and horses. scenes gives you that freedom? MB: I’ve been doing the horses since I was a kid, so they’ve become like a signature. As a child, I didn’t really think about what I was doing; it was more like an exercise. But the urban scenes are much more passionate for me. I feel driven to get at them and solve the problem. With those it’s much more of a struggle, and it feels like I’m always falling short of what I’m trying to do. There’s a great beauty in the line that is effortlessly drawn, with the skill behind it of having of done it thousands of times. I don’t want all the answers to be given to people. I want them to start to look at it and ask more questions, about every part of it and the way it’s executed. The Heart of Downtown, Acrylic on Canvas, 48 × 60 in. personal connection to the subject? MB: Yes, very much so. I had a big house out in the suburbs of Chicago that had all kinds of problems with it, and I spent years trying to fix them. In the process I really got into the bones of the house. I became really interested in different building materials, as well as their health consequences. I think people underestimate the effect on their life of where they’re living and the health of their home. They go to the doctor to try and get help for something and don’t realize it’s probably coming from their house in some way. It’s a big part of what drives me in my life outside of painting. I also see all these painted city scenes where they’re very idealistic. They might show some people or some cars, but for the most part every thing is predictable and pretty. But it’s not what a city really looks like. You can’t go a block in downtown Chicago without having to walk through one of those construction sidewalk areas, or without seeing orange cones everywhere—it’s a zoo! 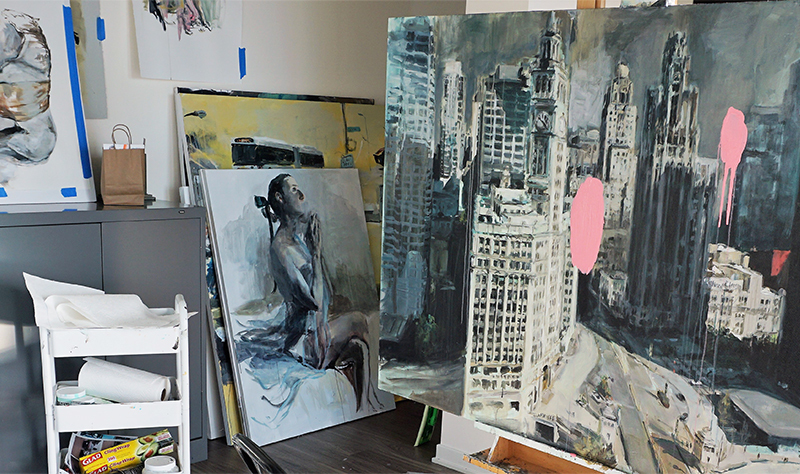 I’m interested in painting what the city really feels like, not the idyllic city scene. So construction elements are a big part of that. Plus they give the opportunity for unexpected color and different materials that make a painting more interesting. 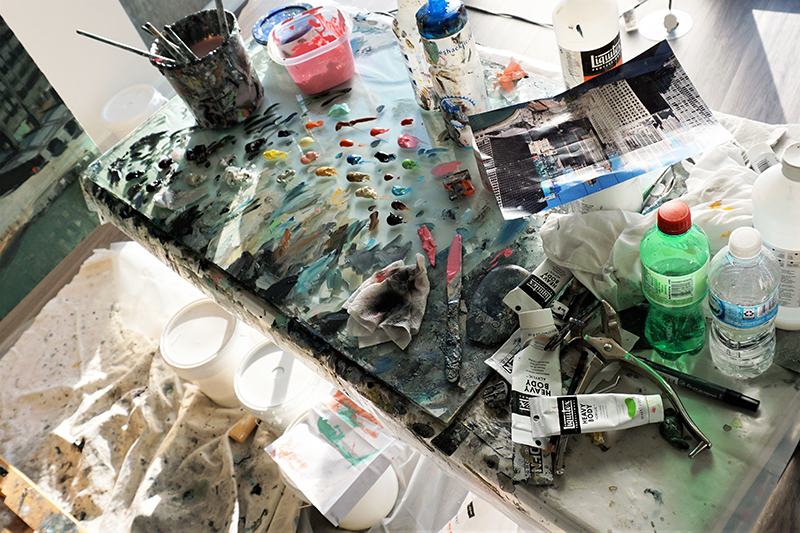 Acrylic paints in Borglum’s studio. Her paintings often have a dark palette with bright accents of color. MB: In my family, all of my male cousins are engineers, my uncles are engineers, my dad’s an engineer, all the guys except one. And a lot of the women married engineers. Here I was, the one that was drawing, so I was raised to be the artist of the family. I really didn’t know if I would have been an artist otherwise, because it’s hard to separate your influences from your parents. I was going to go to vet school, and I changed my mind in the middle of it and switched to art. All throughout school, I did figurative work and horses. Then after school I started doing display work—doing the mannequins and store signing for big department stores. Along the way I fell into this great opportunity with a company that sold accessories and paintings to interior designers when the housing boom was really big in Colorado. Through that I made a lot of connections, and got to the point where I became established with galleries. A Nighttime Story, Acrylic on Canvas, 43.5 × 43.5 in. MB: Early on, I was primarily doing the horses. I used to go out into the neighborhoods around my house and draw people’s houses. I think I’m finally at that point where I accept what my work is and I don’t try to do work like someone else. My urban work has unfinished elements and uncomfortable elements, and it’s not necessarily rendered. It’s interesting to balance the finished, rendered quality of the horses and their emphasis on light, form, and shadow, with my more loose, flowing cityscapes. I am also very interested in portraiture because I’m interested in the essence and emotional content of things. I see my work evolving to include portraiture and figurative works as well. To experience Marilyn Borglum’s work in person, visit the gallery nearest to you.